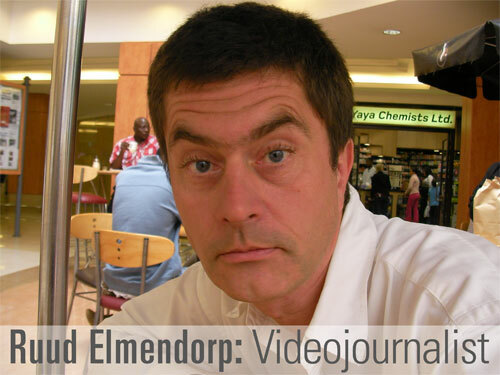 Ruud Elmendorp is a well-known freelance videographer in East Africa, and someone I have been meaning to meet-up with while there. Last month while in Nairobi we finally got to link up for a coffee and discuss a little about his business and the kinds of stories he does. When you get a chance to talk to someone who has interviewed the infamous Joseph Kony in person, you don’t pass it up! Interestingly enough, six years ago he decided to just pick up and move to Kenya to begin his business. It came after having done some work in Southern Sudan, and at a time when life beckoned for him to leave the Netherlands behind. It’s how a lot of first-timers get to Africa, for some it sticks and they thrive, others it breaks them. Of course, we got started talking about equipment, me showing my little Sanyo Xacti vpc-E1 (an ultra-small waterproof video camera), and I swear I saw a little drool escape him at that point… It’s good to know he’s another gadget-head, and was neat to see how he used his mobile phone for a lot of his work (Nokia E-51). ‘I never expected to start a business.’ The 49-years-old Nakakande Uvumba got herself a Village Phone, where people can make cheap phone calls. 15,000 others in Uganda have a new future. Ruud is the national correspondent for RTL (Netherlands) and a regular field correspondent for Rocketboom. He also runs the booming Facebook Videojournalist group. One of these days I’ll be able to afford Ruud doing an AfriGadget documentary. Until then, I’ll enjoy his videos – doing stories that are interesting and always compelling.